Judge Gerald Keefe was first appointed to the Cheyenne County Court in November 2011 and is a life long resident of the county. He was retained as judge by the voters in November 2014. 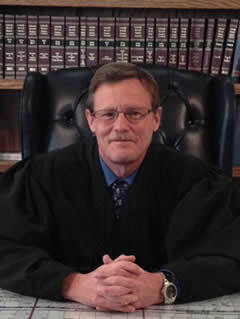 Prior to his appointment, Judge Keefe was the Superintendent of the Kit Carson R-1 School District, a position he held for 20 years until retiring in 2015. He received his undergraduate degree and a Masters in Educational Administration from the University of Northern Colorado. Judge Keefe has always been active in his community and his church. During his time as Superintendent, Judge Keefe supported rural music programs by organizing benefit concerts throughout the state. Currently, he is a member of the Knights of Columbus and serves on the Cheyenne County 911 Emergency Services Board as well. He was also president of the Keefe Memorial Hospital Board from 2013 to May of 2018. Judge Keefe is also the municipal judge for the towns of Cheyenne Wells and Kit Carson. Judge Keefe is an avid sports fan who enjoys watching any event in which a final score is attached to the outcome. He and his wife Kathy reside in Cheyenne Wells and have three children and eight grandchildren.